I've been growing gardenia in my landscape since 1984. Over the years I've tested many, many varieties and have found 10 different varieties that are cold hardy in central Georgia (USDA Zone 8A). Gardenia literally surround my back deck and can be found growing around other outdoor living areas throughout my landscape. Needless to say, I love these evergreen flowering shrubs and just can't get enough of them. Best known for their wonderfully fragrant white flowers, gardenias are heat-loving evergreen shrubs that have become staples in Southern gardens, for good reason. 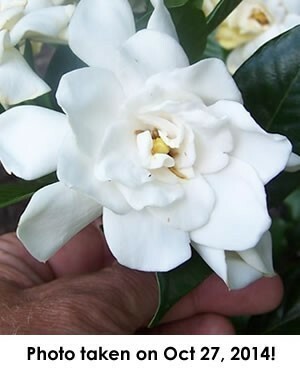 There are many hardy gardenia cultivars (varieties) on the market these days with various outstanding attributes. Of course all have fragrant flowers. Some have single flowers while others have double flowers. Some bloom in spring while others rebloom. Some grow quite large while others are low spreaders. Among all the gardenia varieties growing on my property there's one that stands out as the most cold hardy: the Fall In Love™ Gardenia. I've never seen it damaged or even discolored by cold weather, including 5 degree F temperatures with -10 wind chill during the winter of 2013. Even the Fall In Love™ I have growing in a container outdoors, which exposes the roots to the colder air temperatures, has suffered absolutely no damage. But cold hardiness is not the only special attribute of this extraordinary gardenia...it get's much better...read on. There's a two-fold meaning to the name of the Fall In Love™ Gardenia. Aside from the fact that you'll “fall in love” with the highly fragrant, double flowers and the lustrous, large, year round dark green leaves of this handsome shrub, Fall In Love™ will bloom in spring, summer and againin “Fall.” Hence the name! 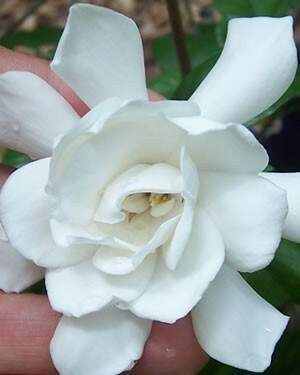 Fall In Love™ Gardenia has an exceptionally long flowering period in which it produces an abundance of it's large (3-4 inch), fragrant, double white flowers. The flowers have a double center that is backed by a pinwheel of single petals. Depending on the weather, the ones growing in my landscape begin blooming sometime in May, repeating for a long period into summer. But the blooming doesn't stop there. The ones growing in my landscape produces a good number of buds and blooms again in the fall! The Fall In Love™I have growing in a 15 gallon size container on my back deck blooms even heavier in fall than the ones growing in the ground. Not sure, but think this has to do with soil temperatures? When growing in a container the roots are exposed to the warmer air temperatures, therefore promoting heavier bud and floer production on this cultivar. No matter whether growing in the ground or above ground in containers, the Fall In Love™ Gardenia I've had growing for 6 years in my landscape have demonstrated exceptional cold hardiness. They've all sailed right through the coldest of winters (down to 5 degrees F) with no visible cold damage or fading of foliage. This means they should be hardy as far north as USDA Zones 7A and possibly to Zone 6A. Regardless of weather conditions, the leaves remain dark green and lustrous year round. That being said, all gardenias appreciate an acid soil with a pH of 4.5 to 5.5. 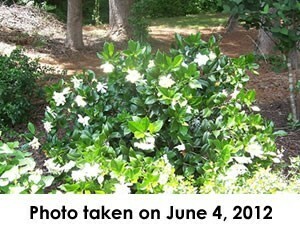 Alkaline soil will cause fading or yellowing of foliage on any variety of gardenia. All-in-all, of the 10 hardy varieties I've grown long-term, the Fall In Love™ Gardenia is without question the most cold hardy. Fragrance - Aside from all the other great attributes, the Fall In Love™ Gardenia produces some powerfully fragrant flowers. The fragrance can be detected from over 100 feet away. What do the flowers smell like? Words simply can't describe the cloud of intoxicating perfume that pours out of the flowers. I would describe the fragrance as a sweet, buttery, vanilla...like a fresh pound cake straight out of the oven...but all my friends say "no, not that." Then I ask them to tell me what they think the flowers smell like and no one can ever come up with a description! One thing for sure, if there were other plants that produces flowers that smelled like gardenias, they'd be a rage among gardeners as well. Form - Over a period of 6 years, the Fall In Love™ Gardenia has grown to about 4 feet tall by 5 feet wide, forming a dense, dark green mound. The one in the large container is a little smaller. Foliage - When not blooming, the large (5 inch long), evergreen, glossy, super dark green leaves of the Fall In Love™ Gardenia provide a lush, tropical look in the garden. When blooming, the dense foliage provides a great backdrop for the large white flowers. Fall In Love™ Gardenia is the perfect choice for a fragrant hedge, in groupings, or as a specimen in landscape or garden beds. Because it's so cold hardy and tough, I have no problem at all recommending it for use in foundation plantings, where long-term hardiness is always a concern. When using it in foundation plantings, I recommend planting it on the east side of the home where it will receive some afternoon shade. Make sure to plant it near patios, decks, porches and other outdoor living spaces where the fragrance can be enjoyed. Sun - As with other gardenia, Fall In Love™ appreciates a little shade or filtered sun during the hottest part of summer afternoons, when the sun is most intense. Soil - I recommend planting Fall In Love™ in well-drained, moist, acidic soil. Add chelated iron, soil sulfur or aluminum to increase acidity in alkaline soils. Water - During the first year after planting water enough to keep the soil moist but not constantly soggy, which can cause disease. Therafter, gardenia should only require supplemental water during extended periods of dry weather. Pruning - Though not required, gardenia respond well to pruning. Heavy pruning to reduce size should be done in early spring. I do a light pruning immediately after spring-summer bloom. Feeding - I feed gardenia with a granular, slow-release acid-loving plant fertilizer in early spring and again after the spring-summer bloom cycle. Do not feed in fall. If leaves fade or turn yellow this could indicate alkaline soil conditions. Appy chelated iron, soil sulfur or aluminum sulfate to acidiy soil for deep greening. 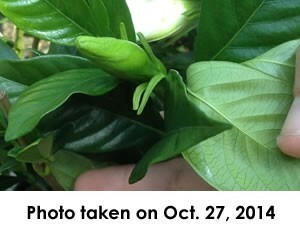 Problems - I've seen absolutely no insect or disease problems with the Fall In Love™ Gardenia. No honeydew aphids, no mealybug, no powdery mildew, leaf spot or chlorosis! Hydrangea, Camellia Sasanqua, Encore Azaleas, Aucuba, Mahonia, Anise Tree, Dogwood, Redbud, Native Azalea, Japanese Plum Yews, Creeping Jenny, Vinca minor (Evergreen Periwinkle), Lamiastrum (Archangel), Autumn Ferns, Hosta Lily, and other plants that like morning sun, afternoon shade or filtered sun.